Network connections are very common nowadays. Not only it is used in corporate environments but at home as well due to the affordable broadband connection offered by our Internet Service Provider. Even a low end computer motherboard would probably come with a built-in network adapter. Setting up a local area network is so much easier today thanks to the multiple port router where all you need is just plug in the network cable and it will work right after going through a simple wizard configuration. Even wireless connection can be quickly and easily established by pressing the WPS button that is found on most newer generation routers. Whether you are a computer technician, engineer or even a normal user, it is important to make sure that your network connection is working properly in order to achieve the fastest file download or transfer speed and a stable connection for streaming purposes. Here are 5 free network benchmarking tools that can be used to test your network speed between computers. The Lite version is basically the free version of the shareware LAN Speed Test. It is an easy to use tool for measuring the speed on your LAN by copying a file to another computer that is located at the same local network. All you need to do is browse the location of another computer on the network where you have write access and click the Start Test button. You will then be prompted to set the file size of the dummy file to be transferred. The good thing about this tool is you don’t need to setup a master and client connectivity. You can also print the results at the end of the test. If you are looking for a more powerful network tester, do take a look at the shareware version of LAN Speed Test that cost only $6 for a license. 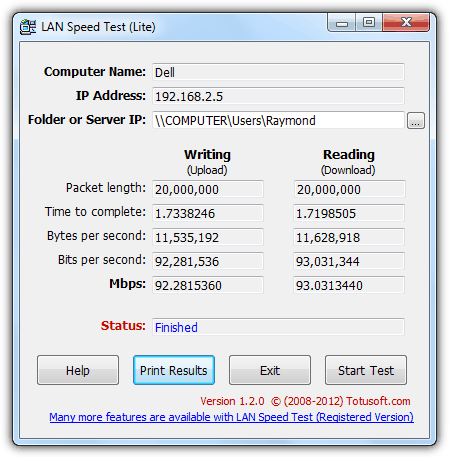 LAN Speed Test (Lite) is portable, small and works in Windows 2000 to Windows 7. 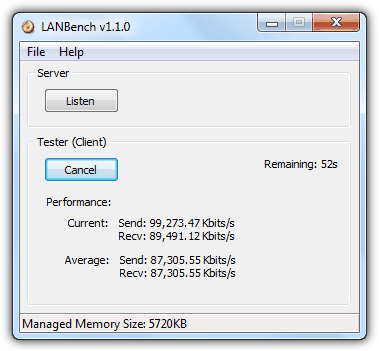 LANBench is also a free and portable utility that test the network using TCP only. You need to run LANBench on both computers, one as server and the other as client which will be the tester. The server part will only nee to click on the Listen button, while at the client side will require a bit of configuration such as specifying the server’s IP address from File > Configure. You can also define the test duration, packet size, connection and transfer mode. During benchmark you can see the live transfer rate and also the average performance. Works on all Windows including 64-bit. NETIO is actually a command line application for benchmarking the network throughput and there is a portable GUI version that works as a frontend. After downloading, run the extractor and followed by running NetIO-GUI.exe. 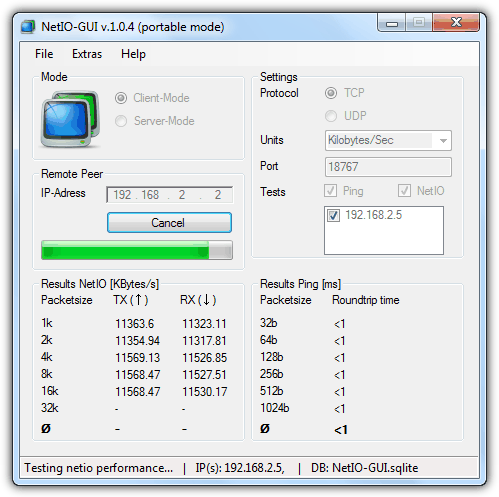 You will also need to run NetIO-GUI on both computers that you want to test, one as client-mode and the other as server-mode. The server will only require to click on the Start server button while for the client, you will need to enter the server’s IP address and optionally selecting the choosing the protocol (TCP or UDP) that you want to test. NetIO will then test the connectivity based on a few different packetsize. 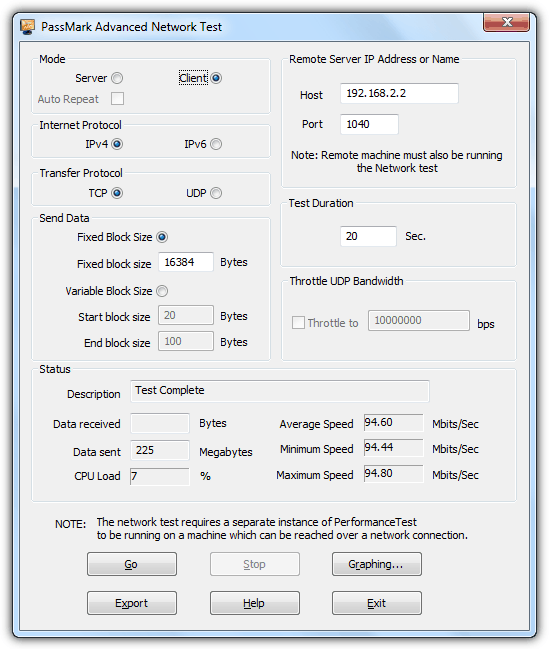 NetStress is a free and simple network benchmarking tool created as an internal tool by Nuts About Nets but is now being released to public. NetStress also requires to run on both computers that you want to test but the good thing about it is it can automatically find the receiver IP address. To run a test, click on the 0.0.0.0 beside the Remote Received IP and select the IP address that is listed in the window and click OK. The start button will then be enabled and clicking on it will start sending and measuring the TCP and UDP throughput. A unique feature found in NetStress is the ability to change the MTU size where you can find in most internet optimization tool. My only gripe with NetStress is the inability to resize the window because it takes up the whole screen. AIDA32 is actually the first and free version of the popular hardware information and benchmarking tool known as EVEREST and now AIDA64. 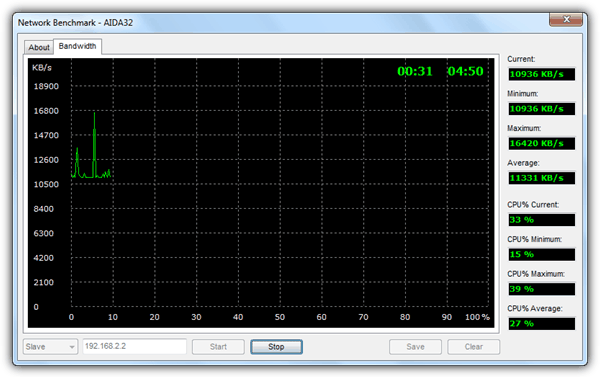 AIDA32 comes with Network Benchmark plugin that is weirdly no longer found in EVEREST nor AIDA64. To run the network benchmark, download, unzip and run aida32.exe. Then click on the Plugin menubar followed by AIDA32 Network Benchmark. Just like most of the network benchmarking tools, you need to run the network benchmark plugin on both computers that you want to test. On one computer, select Master from the drop down list located at the bottom of the window, go to the Bandwidth tab and click on the Start button. On another computer, select Slave, enter the IP address of the Master, go to Bandwidth tab and click Start. The Save button allows you to save the bandwidth chart in bitmap format. Additional Note: There is another network benchmarking tool found in the popular PerformanceTest by PassMark software that comes with an advanced network testing tool. It can test both IPv4/IPv6 and allowing you to set the data block size and enable UDP bandwidth throttling. The advanced network test tool can be accessed from Advanced > Network in the menubar. Although PerformanceTest is a shareware, it can actually be used without limitations for 30 days. The status area shows the amount of data sent to server, CPU load, average/minimum/maximum speed which is enough to determine the consistency of the network speed. 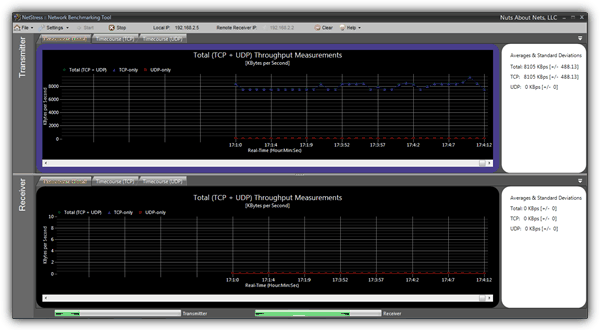 iperf – it’s all you need. Runs from a command prompt, and is multi platform, so for example, you can check throughput from your windows client to your linux server – or vice versa. Watch it! It’s Malware. It install, but won’t uninstall. It says parts must be uninstalled manually. You are not downloading LAN Speed Test Lite which is portable and what we are looking at here, you are downloading the shareware version of the tool. But I need to verify my network speed not only for myself but also for auditors. So, they probably will ask me how I can guarantee that the used app is indeed a reliable testing system and not just beautiful interface with fake numbers? Is any of these apps certified by any autonomous organization? You read my wishes ! I’ve being looking (not very deep indeed) for this type of tools. Many time, visiting a customer to troubleshoot why most computers on the net are slowing down, one of my concern is not only looking for virus or any software sucking the net, instead, it could be a wiring problem in just one spot (like loose connectors, or dirty/rusty plug, 1 damaged switch’s port, etc). The best software in this type would be that which can start measure traffic by increasing transmission block size and speed until it stop responding, generating a log, or multi-point measure as well. Some time, testing 1 wire won’t give the right picture, sometime might be switch have too many collision it would handle.